On a December morning in 1531, the Virgin Mary appeared in Mexico to Juan Diego, an indigenous Mexican farmer. During that first sacred encounter and in several more apparitions over the next few days, Mary spoke to Juan Diego in his native, Aztec language and asked him to petition the bishop to build a church. She instructed him to bring roses to the bishop, and when he opened his cloak to drop the flowers before the bishop’s feet, all those present were stunned to see Our Lady’s image painted on his cloak. Download this prayer in English or Spanish. 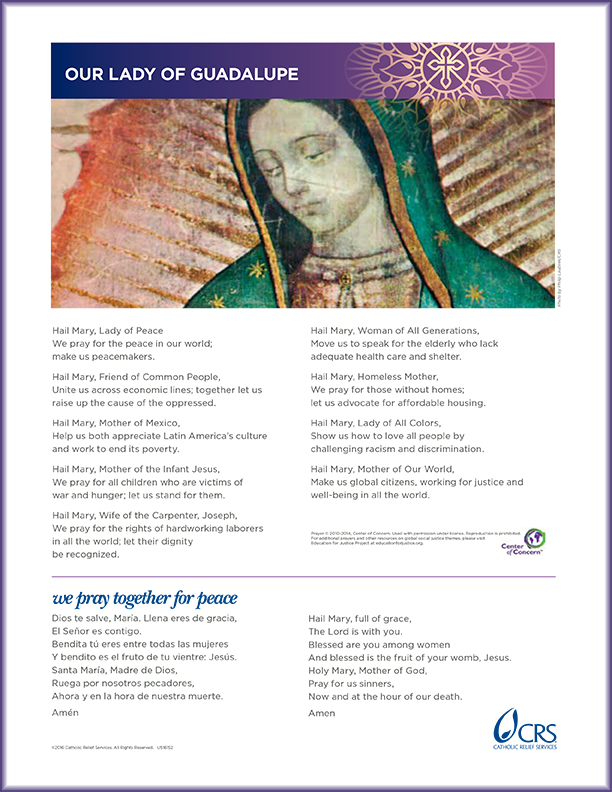 Download a backgrounder on Our Lady of Guadalupe from Justice for Immigrants in English or Spanish. Why did Mary appear to Juan Diego rather than to the bishop himself, or someone else who was more powerful? Mary’s action is a sign of solidarity with those who might not be considered the most prestigious or powerful by society's standards. She shows that even a humble farmer, for example, has important contributions to make. Beginning in 2016, the United States Conference of Catholic Bishops have named the Feast of Our Lady of Guadalupe a day of prayer in solidarity with immigrants and refugees. As the patron of the Americas, Our Lady of Guadalupe gives us a model for how we too might reach out to and welcome those who seek better lives here in our land. This message continues to be relevant for us today when our neighbors include many of the world’s most vulnerable people: immigrants and refugees fleeing war, poverty and persecution, people who seek nothing more than basic needs and a path forward. Just like us, they are children of God, deserving of dignity and love. Our Lady of Guadalupe’s Feast takes place on December 12, during the season of Advent, when we recall how Mary journeyed to Bethlehem with Joseph and gave birth to Jesus in a manger. Throughout Advent, and especially on the Feast of Our Lady of Guadalupe, we ask for Mary’s intercession for the safety and well-being of her fellow travelers – especially immigrants and refugees – and we pray that her witness inspires us to stand in greater solidarity with them.